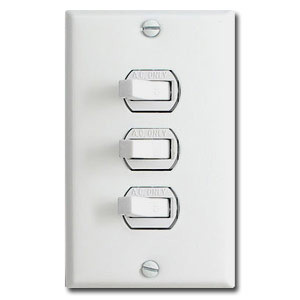 Sideways flip horizontal toggle switch plates were commonly installed in homes in the 1970's and 1980's. They use a duplex opening, which are also used to cover a duplex outlet. Available in a variety of finishes, all UL listed and made in America. Sideways toggle switches fit the exact same switch plate as a duplex outlet. 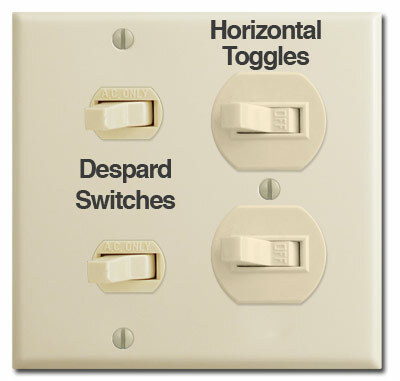 Remove your old switch plate from the wall and look at the base of your horizontal toggle switches. The shape of the base should be identical to a duplex outlet. If you have Horizontal Toggle Light Switches, you'll see a single screw hole in the center between the top and bottom switches. 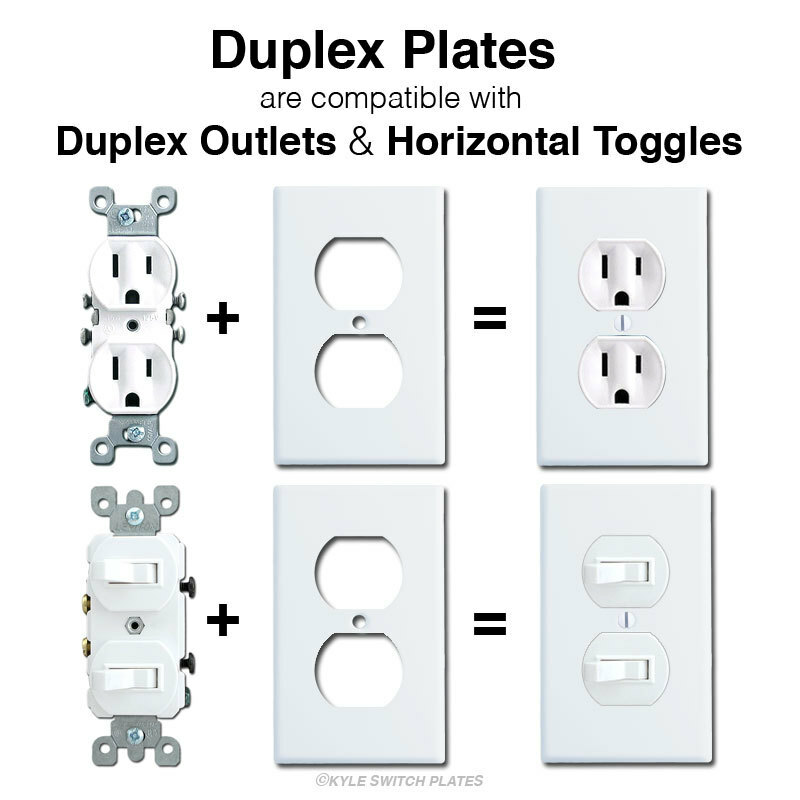 You will need a duplex outlet cover or combination switch plate with a duplex opening. If you have Despard Toggle Switches, which are smaller than horizontal toggles, you'll see that they are mounted in a bracket and the screw holes for the switch plate are at the top and bottom of the bracket. You will need a despard wall plate. IMPORTANT! The Switch Plates below are duplex switch plates shown with horizontal toggle switches. The switches are not included. Shop Combination Switch Plates and look for plates with duplex openings for other combo plates with horizontal toggles. Click to find more configurations of Horizontal Toggle / Duplex Switch Plates or shop for Combination Plates with Horizontal Toggle Openings. Note the size of your switches. 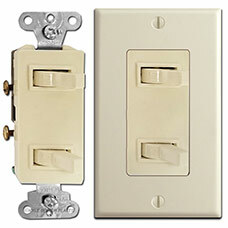 The base of a horizontal toggle light switch is large enough to fill a duplex outlet cover as shown above and below (more than 1" across). And while both types flip east to west sideways, the Despard switches look similar but are much smaller, with a base that's under 1". 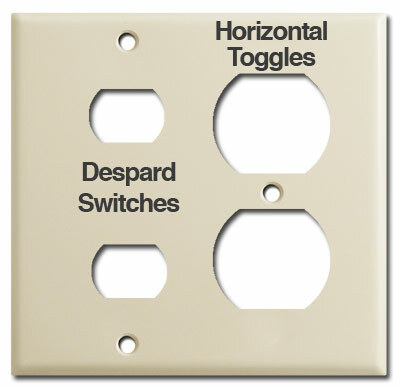 If you need plates for smaller Despard toggle switches, you'll need to buy Despard switch plates. Smaller despard switches are sold invidiually and mounted in straps. Larger horizontal toggles come as a single device with 2 stacked switches. Looking for triple horizontal toggle plates? 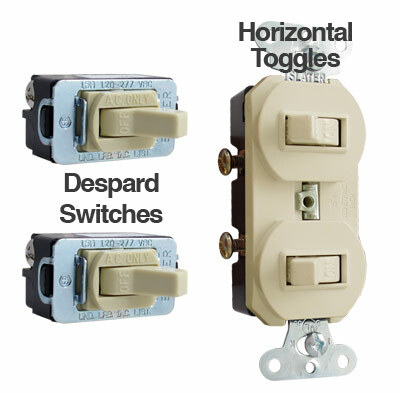 What you need are 3 despard switch plate covers that fit horizontal toggle despard switches. 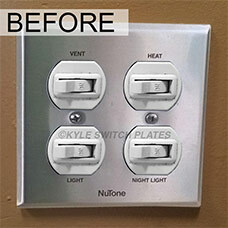 Here's an example of a night light, vent and heat cover for 4 switches in a bathroon. These old NuTone covers had switch labels printed in black above each switch. 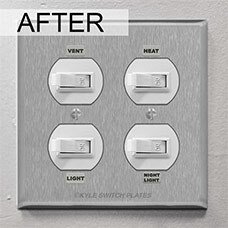 Replace your old NuTone wall plate with a new cover for 4 horizontal toggle switches and choose from a variety of great finishes. Horizontal toggle switches are also available for your bathroom renovation. Add labels to these fan, heat and light switches. These stacked toggle light switches have a large rectangle base and fit rocker cover plates.